Who would pay a state carbon fee on November ballot, and who gets a pass? Proponents say that most of the major fossil-fuel sources of greenhouse gas would be covered, while opponents point to pulp and paper mills, Alcoa and others that gain exemptions. Who would pay a state carbon fee — and who would get let off the hook — in a ballot measure coming up for a vote this fall? That question is getting airtime in the opening weeks of the campaign-advertising season for Initiative 1631, which asks Washington voters to be the first in the nation to approve putting a price on greenhouse-gas pollution released by fossil fuels. The opposition, largely funded by oil money, is running a spot that features a Spokane business woman, Sabrina Jones. She denounces the measure as containing unfair exemptions that give “big corporations a free ride” and shift the burden onto families and businesses. But most of the state’s carbon emissions result from Washingtonians collective reliance on oil, natural gas and coal for the tasks of daily life. The combustion of fuels to operate cars, trucks, boats, planes and railroads releases more than 40 percent of the state’s total emissions. 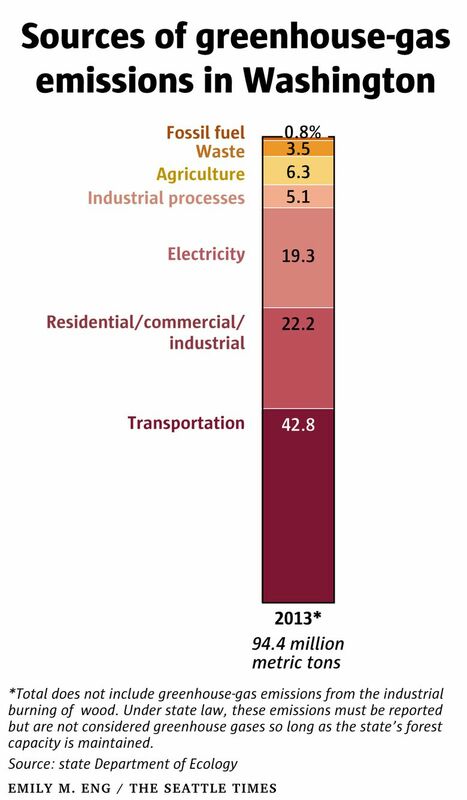 Other major sources of state greenhouse-gas emissions are the generation of electricity, and fossil fuels used for heating and other purposes in homes, commercial buildings and industries. Collectively, these sectors produce just under 40 percent of the total emissions, according to a 2013 state Department of Ecology analysis of annual emissions from fossil fuels as well as smaller amounts from industrial processes, waste disposal and agriculture. The carbon fee would take effect in January 2020 starting at $15 per metric ton, which would add about 14 cents to a gallon of gasoline. The fee would increase each year until Washington is on track to meet statewide goals for reducing greenhouse emissions. The fee would be assessed against oil companies, utilities and other “large emitters,” according to the initiative, even if the pollution is produced by those who purchase the fuel. By 2023, the fee is expected raise more than $1 billion annually, which would be spent to help cut state greenhouse emissions and adapt to climate change. So what about exemptions to the fee? I-1631 certainly has some — although fewer than a bill considered in the Legislature earlier this year, according to state Sen. Reuven Carlyle, Seattle Democrat, a supporter of the initiative who helped to draft the unsuccessful 2018 legislation. “I have page after page of materials asking for the very exemptions that are now being criticized,” Carlyle said. Some of them included in I-1631 often arise when carbon pricing is considered, such as excluding fossil fuels used in maritime and aviation industries and on farms. Others reflect agreements that environmental groups involved in drafting I-1631 already have reached with polluters. An exemption would be granted to the state’s largest point-source of greenhouse gases — the Centralia coal-power-generating plant operated by TransAlta — because it already has committed to shutting down by 2025. Two units of a Montana coal plant that provide power to Washington state also would not be subject to the fee because they are closing before that deadline. Some industries whose products face international competition got exemptions so their products could stay competitive. That includes Alcoa, which operates a major smelter in Ferndale, Whatcom County, that in 2013 generated more than 1 percent of the greenhouse-gas emissions included in the state’s annual total. The opposition campaign has highlighted the absence of carbon fees on paper and pulp mills, and a Kettle Falls biomass power plant. These industrial operations represent six of the top 12 point-sources of pollution on a list compiled by opponents from state reporting records. “They (initiative proponents) say they are going after the biggest polluters but they are not,” said Dana Bieber, a spokesperson for the No on 1631 Coalition. But there are some important caveats not mentioned in the opponents attack ads. Most of the carbon emissions from the mills and Kettle Falls power plant result from burning wood — not fossil fuels. State law requires these wood-based emissions be reported, but it also says they “shall not be considered a greenhouse gas,” as long as the Washington forest base is maintained. The state law reflects the view that wood emissions are “carbon neutral,” reabsorbed as new trees take root and grow. Greenhouse gases released from wood-burning boilers are not counted in the year-end tally of greenhouse-gas emissions, according to a state Department of Ecology official. If they had been included, the five mills and the wood-burning power plant would have raised the 2013 Washington total from 94.4 million metric to more than 100 million metric tons, according to a Seattle Times analysis of greenhouse-gas reporting records. Among climate researchers, the impact of wood-burning carbon emissions is still a topic of debate. Some scientists note that it takes decades for new forests to grow and take up all the carbon released from the older trees, according to a March 2018 Scientific American article. In the meantime the releases contribute to climate change, and, thus, do have an impact, according to the critics. Bieber, spokesperson for No on 1631 Coalition, says the wood-based carbon emissions should not be ignored by the proponents. “They are trying to cherry pick the data,” she said. Proponents point to the Washington law that considers them carbon neutral. “They aren’t considered to be greenhouse gases under state law, and we can’t change that with an initiative,” said Nick Abraham, a spokesperson for the Yes on 1631 campaign. 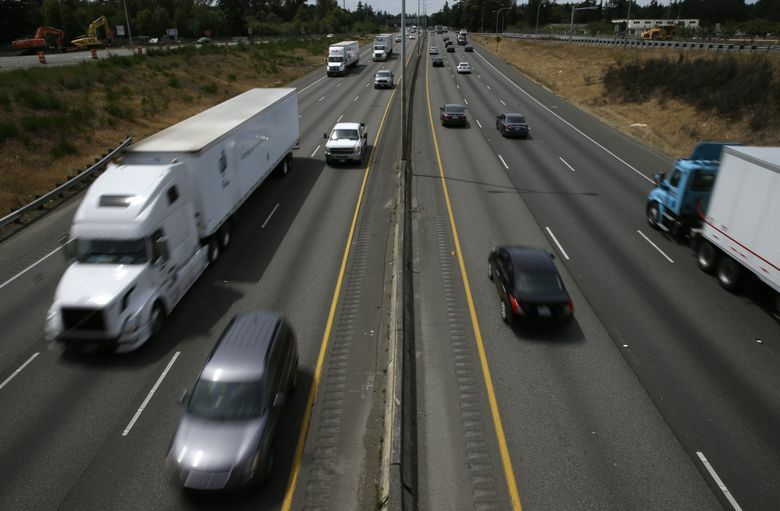 The proponents and opponents of I-1631 also clash over the broader question of how much of the state’s carbon emissions would be subject to the fee. Proponents say the initiative is intended to target fossil fuels that scientists have flagged as a key driver of climate change. So it should be judged on how many of those emissions are covered by the ballot measure. “Fossil fuels are the number one problem, and that’s what we are going after,” said Vlad Gutman-Britten, Washington director of Climate Solutions and one of the proponents who helped draft the initiative. After the closures of the Centralia coal plant, about 80 percent of the state’s fossil-fuel emissions will be subject to the fee, proponents say. Bieber thinks the calculation should be made on a wider range of greenhouse-gas releases that includes the pulp mills as well as all those included in the state’s annual tally. By that definition, the amount of emissions covered by the fee would be considerably lower, possibly under 60 percent during the early 2020s when the Centralia plant is still operating. “The proponents define pollution as greenhouse gases, so we need to be talking about all greenhouse gases, Bieber said. The town of Ferndale is located in Whatcom County. An earlier version of this story incorrectly identified it as being part of Skagit County.